Dakota cabs feature modern OEM styling with curved tubing front corner posts, easy door removal, external door locks, high impact ABS roof, acoustical headliner, curved front windshield, front windshield wiper, front & rear hinged windows, pre-wired for optional accessories. Cab is not ROPS certified, but fits over the existing, un-modified factory ROPS. Easy installation, unit comes pre-assembled, ready to drop onto the tractor and secure in place. 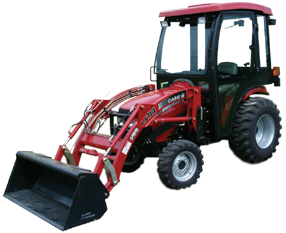 Special Fit-up Notes: This cab will fit bare tractors or tractors with a LX114 or L340 loader. Some Non-Deluxe "D" models may require floor mats or fillers (under/behind seat, between fenders) from your Case IH dealer to completely enclose floor openings in the platform. Some models may experience loader hydraulic line interference - Flexible replacement hose solutions are available, consult your OEM equipment dealer. Cab height is approximately 71.5 inches high, measured from the platform floor.